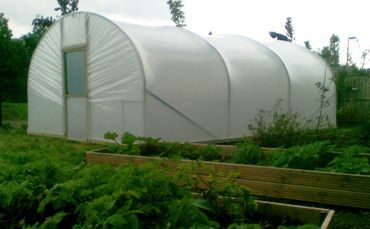 Our 14ft wide range of polytunnels use a robust 38.1mm diameter tubing for the hoops, ridge and corner struts. The steel is high tensile "Z35" grade which is galvanised and has a 1.5mm wall thickness. For the foundation tubes we've made sure that strength and corrosion are definitely not a problem - The tubing used has a wall thickness of 3.25mm and is hot-dip galvanised. 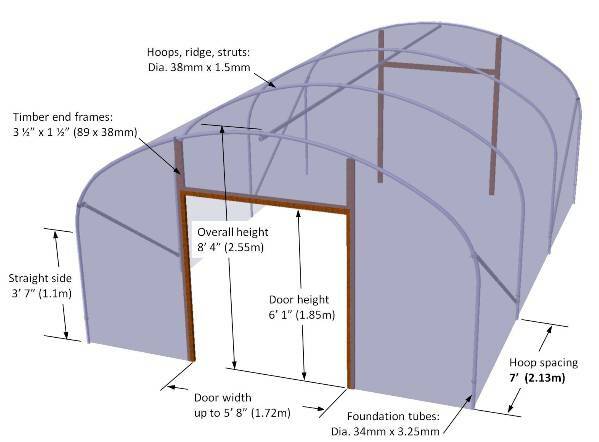 For our 14ft wide range, the polytunnel hoops are spaced at 7ft apart for a fast build whilst maintaining superior strength. As with all our polytunnels we've made sure there are no weak links and each component is designed to ultimately fulfil it's purpose. Quite simply, we doubt you'll find anything stronger! See below for a detailed specification. Foundation Tubes: Diameter 34 x 3.25mm thick-walled, heavy galvanised with cover re-tensioning system. Hoops and Ridge Tube: Z35 high tensile galvanised steel tube, diameter 38.1mm with a thicker wall of 1.5mm. 800g Clear for the most natural light conditions. Best for ripening crops. 800g Diffused scatters light for even plant growth. Best for sunnier locations. Purpose-designed so each type of bracket is perfect for its intended use. Corner Braces: Z35 galvanised steel tube, diameter 38.1 x 1.5mm. Special design with angular adjustment for sloping sites.